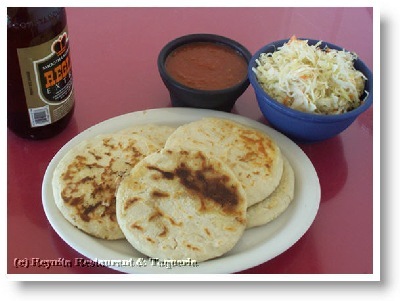 *hand made tortillas filled with your choice of filling and served with cabbage, spicy or tomato sauce on the side. Thin steak marinated in salvadorean herbs and spices. Topped with grilled onions and green peppers. 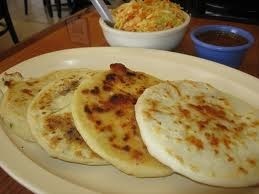 Also served with a side of rice and beans and your choice of tortillas. Thick pieces of slow cooked steak with spices in a salvadorean style. Served with rice, beans and tortillas. Salvadorean chicken pot roast. Served with rice, beans and tortillas. Sauteed chicken in mild salvadorean tomato sauce and sour cream. Served with rice, beans and tortillas. Thin beef stripe OR chicken with grilled onions and green peppers, mushrooms, tomatoes and melted cheese. Served with rice, beans and tortillas. Grilled skirt steak. Served with rice, beans, sour cream and tortillas. Sauteed prawns with mashrooms,onions and garlic sauce. Served with rice, beans, salad and tortillas. Prawns cooked in spicy hot sauce with onions and mushrooms. Served with rice, beans, salad and tortillas. Prawns sauteed in mushrooms, onions, mild sauce and sour cream. Served with rice, beans, salad and tortillas. A whole Tilapia fish fried to perfection. Served with rice, beans, salad and tortillas.